So the hard work has paid off and after months of studying and exams you're off to uni. This can be a really daunting experience, I know I was terrified when I started last year, but it doesn't have to be. Freshers week is a such a good week to meet new people, party, find out more about where you're going to be studying and have loads of fun. I've got five tips to share with you that proved helpful to me, and some that I wished I'd known before I started! 1. Everyone is new, a bit nervous, and probably a little homesick. And that's the great thing about freshers week, you're all feeling the same - unlike starting college or sixth form you don't know anyone from school, especially if uni involves you moving away from home, so it's a great chance to make new friends from all over the country as well as from different countries. If you've always lived at home with your family, having to fend for yourself and live with people you don't know can be challenging and nerve racking, but trust me there'll be loads of other people with exactly the same worries - you won't be alone. Some people won't let on that they're homesick or nervous, but in reality they are, so don't think that you're the only one finding it all a bit difficult - it'll come to you soon enough. 2. Eat Proper Food. This sounds like a bit of a weird one but try to avoid to student stereotype of eating instant noodles. Not only are they unhealthy and only leave you hungry, but it's cheaper to buy ingredients and make your own meals. Before I left for uni, I practised some of my favourite recipes my mum uses so I had some meal plans I knew worked and I enjoyed. Also making your own meals rather than using instant packets means you can make double batches so you have leftovers for the fridge and freezer - essential for when you really can't be bothered to cook. 3. 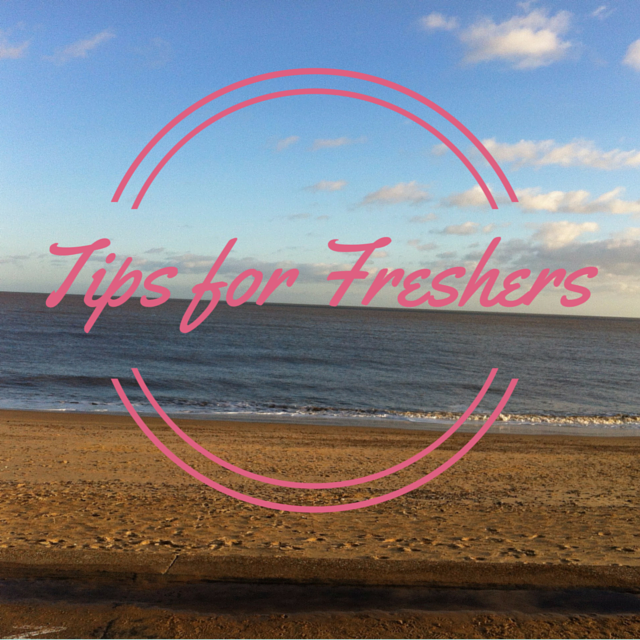 Your student loan is for the term, not just for freshers week! When your first installment of student loan comes in, it's easy to get excited to see so much money in your account, and instantly plan up a wish list of things you've been saving up for, or spend it all on parties and nights out with newly made friends. But that loan has to last the term. It's a good idea to plan your finances before you go so you know how much money you can afford to spend each week. I allowed a little extra per week for freshers week and the next couple of weeks after whilst I was settling down. It's pretty essential to plan these things otherwise you'll find yourself in your overdraft with no money wishing you'd been more careful. 4. Keep your door open as much as possible. As most do, for the first year I lived in halls. Mine consisted of a block of flats where 3 bedrooms shared a kitchen and bathroom. It's such a good idea to leave your door open when you can, it makes you seem a lot more friendly and it's less of a big deal to then start talking to the other people you live with and around. Obviously have it closed when you're sleep and dressing etc, but having it wedged open at other times means people can just pop their head in to say hi - it's the easiest way to start talking and getting to know people. 5. Enjoy yourself! Freshers week is all about having fun, so enjoy it. You may be super tired and much rather stay in and watch Netflix, but go to everything - say yes to all the parties and events even if they don't sound like your kind of thing. You'll end up having a great time, I know I did more than I thought I would, making new memories to laugh over, and new friends.